So far this has been a very busy week, especially in the options market. December 13th was apparently a great day to close out some put options since some of the volatility and time premium had come out of the shares. That's fine by me since it let's me close positions out early, lock in some gains and search for other opportunities. I'd love to be active in purchasing the shares outright; however, there honestly isn't much that I see trading at good valuations. For the most part the businesses I'm interested in adding are still on the high side of fair value. While that's not a horrible place to start adding shares I don't want to make big commitments at this time. So that leads me to the options market, specifically put options where I can effectively set limit orders on companies I want to buy and take in a cash premium up front for the "risk" of possibly buying the shares. That allows me to boost up the investment income while waiting for better opportunities, which is why I consider put options the best of both worlds. I had previously sold the put option on Unilever at the beginning of December and received $49.95 cash via the option premium. Of course that was just a quasi-insurance payment to me since I was at risk of buying shares of Unilever for $37.50 per share any time until expiration. Unilever's share price had rallied a bit since I opened the position so I decided to buy the option back to close the position. The premium was a bit lower than I'd like although it was par for the course considering Unilever's "lower" share price around $40 and the short time frame of the option. The net profit works out to $29.91 or 0.80% based on the capital "at risk". On an annualized basis that was a great 27.35% return. The next put option that I closed was one that I had opened just one week prior. I don't normally aim for just a one week period of a put option being open; however, if the market is going to give me the opportunity then I'm going to take it. In hindsight I should have been less aggressive with closing this put option out and likely could have aimed for a higher return considering that I would be very happy to buy shares of Nike below $48. But the position is closed and I was able to lock in a solid gain. 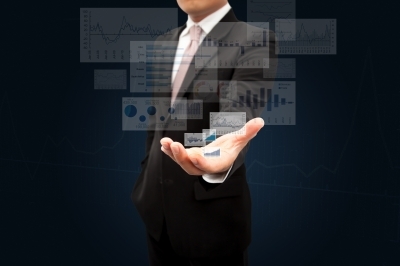 The net profit on the put option works out to $47.91 or 0.99%. On an annualized basis that's a solid 67.01% return. Now if only I could find a way to consistently replicate that success! Surprisingly enough the Visa put option was the one open the longest at 21 days. With expiration looming at the end of this week I wanted to make sure I locked in a profit before the Fed announced the likely hike in interest rates. No that wouldn't really effect Visa's business, but when the markets go haywire you never know what can happen. I missed out on a bunch of premium when I sold the option and if I had waited just one more day before opening the position I could have sold the exact same contract and taken in at least another $50 in premium. This put option strayed from my typical 10%/10% strategy when I opened it although I would have been content buying shares of Visa at the $77.50 level, the strike less the premium, and then turning around and selling call options on those shares. The net profit works out to $68.91 or 0.88% based on the capital "at risk". On an annualized basis that works out to a solid 16.42%. 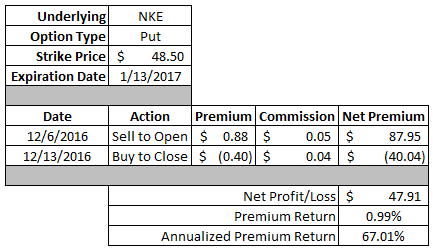 The 3 put options that I closed netted me a total of $146.73 in premium from option premium. Considering every one of those put options were written at levels where I'd have been content to own the shares that's a win in my book. That pushes my December option profit up to $425.47 and 2016's total, started in September, to $651.88. Keep in mind that includes the Target Corporation covered call that went horribly wrong and is currently showing a $323.74 loss. I book gains/losses as positions are closed, but since I rolled the call up and out, it's technically still open. Excluding the Target call loss pushes the September-December total up to $975.62. Not bad for about a 3 month time period. I've reduced a lot of my option exposure over the last week or so, but have no fear I've ramped it back up this week as well in a bit more aggressive of a manner. We'll see if my aggressiveness pays off. Do you use put options to effectively set limit orders on companies you want to buy and get paid while you wait? Amen brother. It never hurts. Nice job closing at a profit. Good article. I learned this lesson early on as there is nothing wrong with taking some profit. I know Jim Cramer isn't everyones favorite but he has a saying regarding this topic: "Bulls make money, Bears make money, Pigs get slaughtered"
Selling options is all about taking profit of the table. Great move. My Unilvere put options is not doing that well... Deep ITM right now... I have time on my side.